If you’ve seen this guy around Facebook recently, you may have been inclined to think “lucky blighter, he’s now rich for life”. And yes, that’s the draw with the $587.5 Million jackpot. Well it turns out Nolan Daniels is not rich for life. 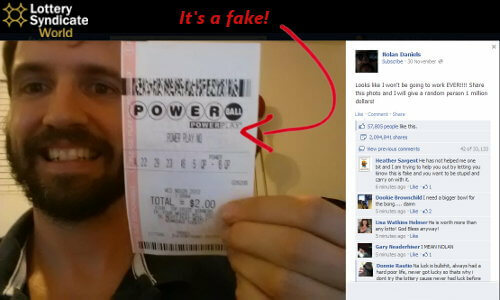 The winning Powerball ticket he is clutching is actually a fake. Which is also why this has turned out to be one of the most shared photos Facebook has ever seen. The 33,129 and counting comments the post has attracted consist of what a lottery winner without the option to stay anonymous can expect. They range from lots of ‘good luck brand new best friend’ type messages, right through to the sob stories and begging letters that certainly won’t be hitting their mark on this occasion. No matter how true or deserving. So How Do We Know It’s a Fake? You can clearly see the numbers do match the winning numbers drawn – 5, 16, 22, 23, 29 and a Powerball of 6. And the date although fuzzy looks right. The biggest giveaway though is that in his attempt to make the ticket look more plausible, Nolan decided to randomly order the numbers on his ticket – they appear as 22, 29, 23, 16, 5. 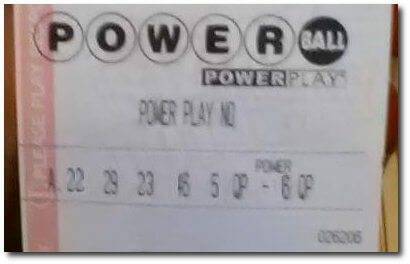 But as any regular Powerball player should know, numbers are always printed in order on the ticket. You can also verify this fact on the official Powerball site here. So in his attempt to look more authentic, Daniels has actually tripped himself up. We already knew there 2 tickets claiming the jackpot, one in Missouri and one in Arizona. The winning couple from Missouri are Mark and Cindy Hill, who have already been publicly revealed at a press conference. They will collect a cash lump sum payment of around $192.5 Milllion. And are already looking forward to, as they put it, a “pretty good Christmas”. I’ll bet they are. Now the winner from Arizona has not yet been formally identified. But ABC News reported a man checking his numbers at a gas station in Maryland who appeared to be the second winner. The man looks pretty happy, and also shows his ticket to colleagues and the store clerk too. When interviewed later they confirmed the story. Needless to say, the man didn’t look anything like Nolan Daniels. Better luck in the next draw Nolan. Are you sure he didn’t win anything? The same I don’t believe because I win and I don’t have the money and specially because it’s free but until now nothing! So it better I forget about this.